Families of the victims of the Sept. 11 attacks today celebrated a federal court's ruling that allows relatives of people who died in the 9/11 terror attacks to sue Saudi Arabia. Most of the hijackers who attacked the World Trade Center and the Pentagon in 2001 were from Saudi Arabia, and the complaint states that much of the funding for the al-Qaeda terrorists came from Saudi Arabia. 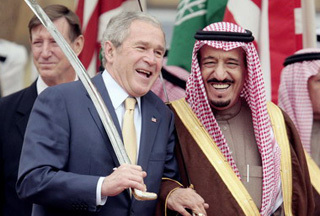 An attempt to Saudi Arabia in 2002 was blocked by a federal court ruling that said the kingdom had sovereign immunity. That ruling was reversed Thursday by a three-judge federal panel.